The author examines amphibious operations from Gallipoli to the Falkland Islands to determine why the defenders were unable either to prevent the attackers from landing or to throw them back into the sea after they had fought their way ashore. The Marine Corps is known for its heroes, and Lieutenant General Lewis B. Puller has long been considered the greatest of them all. His assignments and activities covered an extraordinary spectrum of warfare. Puller mastered small unit guerrilla warfare as a lieutenant in Haiti in the 1920s, and at the end of his career commanded a division in Korea. In between, he chased Sandino in Nicaragua and fought at Guadalcanal, Cape Gloucester, and Peleliu. With his bulldog face, barrel chest (which earned him the nickname "Chesty"), gruff voice, and common touch, Puller became—and has remained—the epitome of the Marine combat officer. 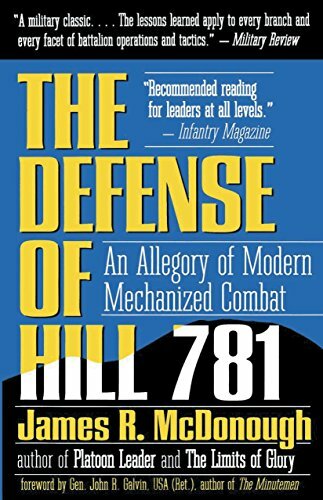 Recalling the humorous spirit of the Defence of Duffer's Drift, The Defense of Hill 781 is a modem version of this classic. It is a tactical primer with ample fun-poking, but with serious lessons to be learned. Through a series of six missions, the reader plans and fights with Lt. Col. Always, making the split-second decisions that determine victory or defeat, life or death. Through successive difficulties, some important lessons are burned into the commander's brain--lessons about tactics, about people, about what it takes to fight a winning battle. During the Korean War, 234 heroic Marines from Fox Company, First Division, held off a force of 10,000 Chinese soldiers in subzero weather to secure the Toktong Pass. This is their story. Collection of interviews with members of the Montford Point Marines Association, organized by chronology and theme. This recognizes and honors the men who desegregated the Marine Corps and loyally served their country in three major wars. It is about the first black recruits who received Marine Corps basic training at the segregated Camp Montford Point (adjacent to Camp Lejeune). Between 1942 and 1949, more than 20,000 men trained at Montford Point, most of them going on to serve in the Pacific Theatre in World War II as members of support units. In this narrative, the author weaves accounts of his combat experiences with thoughtful analysis, self-examination, and his readings from Homer to the Mahabharata to Jung. He talks frankly about how he is haunted by his wartime experiences and how he finally finds a way to make peace with his past. He discusses the daily contradictions that warriors face in the grind of war, where each battle requires them to take life or spare life. He also underscores the need for returning veterans to be counseled properly. First-person account of fighting at Peleliu and Okinawa. Eugene Sledge was part of WWII’s famous 1st Marine Division, 3d Battalion, 5th Marines. It is based on notes Sledge secretly kept in a copy of the New Testament and documents what saved, threatened, and changed his life. It is also a story of how Sledge learned to hate and kill–and came to love–his fellow man.